Did you know that September is National Breakfast Month? We are HUGE fans of Breakfast night in our house. It's quick, easy, and oh so yummy thanks to Krusteaz mixes! In a national survey, Krusteaz found that nine out of ten (91 percent) Americans say they eat breakfast for dinner, with 56 percent doing so once a month or more often. For families, the trend is even more prevalent as 67 percent of respondents with children in the household say they have breakfast for dinner once a month or more. 2. In large bowl, blend together Krusteaz Buttermilk Pancake mix, non-dairy creamer & water with a wire whip. 3. Batter will be slightly lumpy. 4. Pour slightly less than 1/4 cup batter per pancake onto lightly greased griddle. 5. Cook pancakes 1-1 1/2 minutes preside, or until golden brown, turning only once. 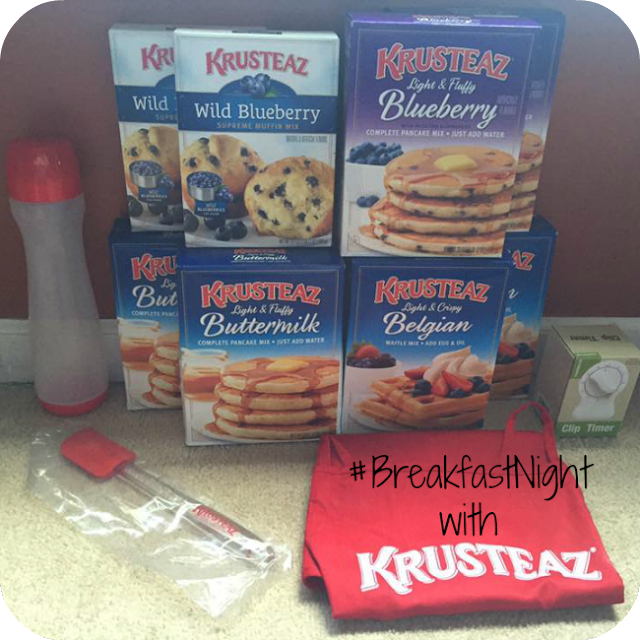 Enter to win one box of each of the following Krusteaz mixes: Buttermilk Pancake, Belgian Waffle, Wild Blueberry Muffin, and Blueberry Pancake plus a pancake pen, a spatula and a coupon for free product! Nanny to Mommy received complimentary products to provide this review. No monetary compensation was received. Nanny to Mommy and participating bloggers are NOT responsible for prize fulfillment. This giveaway is open to US only, must be 18+ to enter. One entry per household/IP address. No social media was involved in this giveaway in any way. Winner is chosen via Random.org through Rafflecopter. ALL winning entries ARE verified. Winner will have 48 hours to respond with all information in email or another winner will be chosen. If you would like to see your product featured in our upcoming Holiday Gift Guide or sponsor a giveaway event, please contact Diana.n.chastain@gmail.com. i would like to try Cinnamon Crumb Quick Bread with my breakfast it looks so delicious. I like to make uttermilk Pancakes with Nutella® Hazelnut Spread. Lemon Blueberry Pancakes these look so delicious my family would love them and all the other recipes too. I would love to try the PB & Jamcakes. I would like to make Lemon Blueberry Pancakes. These vanilla pancakes sound amazing! I love Vanilla!!! I'd love the PB and Jamcakes and so would my kiddos. PB and J jamcakes looks really good, my kids will love it. I would love to make the lemon blueberry pancakes. My kids and I love breakfast for dinner! I would like to make the Pancake Turnovers. I'd love to try the blueberry pancakes. I would love to try the Apple Ham Pancake Streusel!! Yummo!!! I would like to make the Lemon Blueberry Pancakes for a delicious dinner. I visited the Krusteaz site and I would love to try the Sautéed Banana Pancakes for Breakfast At Night sometime. I'd like to try the Spiced Apple pancakes. This is making me hungry. The Lemon Blueberry Pancakes sound awesome, thanks! I would most like the lemon blueberry pancakes recipe. We have a lot of blueberries we picked and froze to use. My two favorite flavors is Lemon and Blueberry. I know that would be delicious. I have never had that combination in many things.!!! My favorite is the recipe for south of the border cornbread. I would like to try their Turtle Monkey Cakes recipe. I would really like to try the Apple Cranberry Pecan Pancakes, they sound delicious. I would like to try the lemon blueberry pancake recipe! I would like to try PB & Jamcakes. I would make for my family the lemon blueberry pancakes. I would like to try Hazel nut Pancakes. I would make Hazelnut Pancakes. I would love to try the PB & Jamcakes!!! Apple Bread Pudding sounds great! I'd like to try the Lemon Blueberry Pancakes. I would love to try Lemon Blueberry Pancakes! My family loves breakfast nights. I usually have one every other week, and fix different things. I've never made Crepes, but that is the recipe that I would try. I would love to make the Peaches & Cream Pancakes! French vanilla waffles would be amazing. I want to try the Pecan Waffles! Yummy! I want to try the Spiced Pumpkin Muffins recipe. The Pumpkin Spice Pancakes would be great to try! Everything sounds so delicious. But I think I'd really like the Cinnamon Apple Bars. Mmm, first would be Wild Blueberry Muffins! I think the Spiced Apple Pancakes look yummy. I would love to make PB &Jam cakes! We would have Blueberry Pancakes with Bacon , Our favorites! I would love to try the blueberry cinnamon crumb cake or the berry cobbler, that is hard to choose between! The Lemon Blueberry sound delicious! I would love to try the Tropical Waffles recipe. I want to try the spiced apple pancakes. My children and I would try to make the Southern Style Waffles first! I would like to try Lemon Blueberry pancakes. I would try the Lemon Blueberry Pancakes! I would love to try buttermilk pancakes with Nutella Hazelnut spread. They sound delicious! French Vanilla pancakes sound great to me. I would love to try the lemon blueberry pancakes. I would love to try lemon blueberry pancakes!! I would like to try Vanilla Orange Waffles, they sound delicious. I would like to try the PB & Jamcakes recipe b/c I know my family would love it! You know, I don't do Breakfast Night, but those PB & Jamcakes look like they might change my mind! Would love to make Buttermilk Pancakes with Nutella® Hazelnut Spread! I want to try the Turtle Monkey Cakes. I think I would try Buttermilk Pancakes with Nutella® Hazelnut Spread. I would like to try the recipe for Berry Pancake Topping. I would like to try the Crepes. I would really like to try the vanilla pancakes. Vanilla is my fav flavoring yummy!! There are so many GREAT recipes. I would love to try the Spiced Autumn Muffins. The carrot pineapple muffins sound interesting. Thanks! I would love to try the Pumpkin Spice Pancakes! :) Yummy! I would make the Southwest casserole, looks like something my family would like. I'd like to try PB & Jamcakes! I would make blueberry lemon coffeecake. I like anything baked with lemon flavoring. I want to try PB & Jamcakes. My kids would love these! I know the boys would love the PB & Jamcakes while I would love the Morning Pie. There are a lot of them that sound pretty yummy tho. I'd Like To Try The Spiced Apple Pancakes Recipe. sarah s I would like to make the PB & Jamcakes and the Harvest Zucchini Pancakes. The Spiced Apple Pancakes sound yummy! I would love to make blueberry waffles or pancakes. My kids would love the Buttermilk Pancakes with Nutella® Hazelnut Spread. It's like dessert! I would like to try the French Vanilla Pancakes Recipe. I would most like to try the recipe for the blueberry cinnamon crumb cake....yum! I would love to try the Sautéed Banana Pancakes. I would try to make the crepes. And top them with the Berry Pancake Topping - delicious! I am going to try the Pumpkin Spice Waffles. The recipe i would like to try for breakfast night is Almond Poppyseed Pound Cake. I would like to try Buttermilk Pancakes with Nutella® Hazelnut Spread. I'd try Raspberry Almond Muffins! I would love to try the Buttermilk Pancakes with Nutella® Hazelnut Spread! I'd like to try the crepes with fresh berries for Breakfast Night. I would make the lemon blueberry pancakes. Lemon Blueberry Pancakes would be yummy. I want to make the lemon crepes! I would make pecan waffles and blueberry. We love all things blueberries. I would like to try the cinnamon sugar rollup with Nutella hazelnut spread. I would love to try Belgian Waffles with Nutella® Hazelnut Spread! I would like to make the Lemon Blueberry Pancakes for dinner. I would like to try the Lemon Crepes. I'd like to try the Cinnamon Crumb Quick Bread recipe. Thanks. I want to try the Lemon Blueberry Pancakes. the Lemon Blueberry pancakes sound divine. I'd like to try the lemon blueberry pancakes! I'd love to try the Peach Berry Muffins, YUM! I would like to make the cinnamon apple bars. They look good. i would love to try the lemon blueberry pancakes recipe! my whole family would really like that! I would like to try Peaches & Cream Pancakes! The Lemon Crepes or French Vanilla Pancakes would be awesome! Lemon flavored ANYTHING sounds great to me though! I would love to try the Lemon Blueberry Pancakes. They sound divine. I would like my husband to make Lemon Blueberry Pancakes. I would like to try the Buttermilk Pancakes with Nutella Hazelnut Spread, because NUTELLA! I would love to try the Vanilla Pancakes first! The Peaches and Creme ones sounds delicious. Would like to try them. I would love to try the French vanilla pancakes. I would like to try the Spiced Apple Pancakes recipe for Breakfast Night. I would like to try the Buttermilk Pancakes with Nutella Hazelnut Spread. Everything looks great but I would love to try the crepes with berries. Pancake Turnovers with blueberries and bananas sounds wonderful, with crisp bacon and over medium eggs, sound great to me..
i would love to make the PB & Jamcakes recipe. I would love to try the Pancake Turnovers.They look delicious! I think I would love to try the PB and Jamcakes. I would love to try the Vanilla Orange Waffles recipe. The pecan waffles look absolutely delectable! My family would enjoy lemon blueberry pancakes. I would make the Apple Pecan Cake! I would like to try the silver dollar sliders. The French vanilla pancakes sound amazing. We love Krusteaz pancake mix. We like eating breakfast at night to. I want to try the vanilla ones.